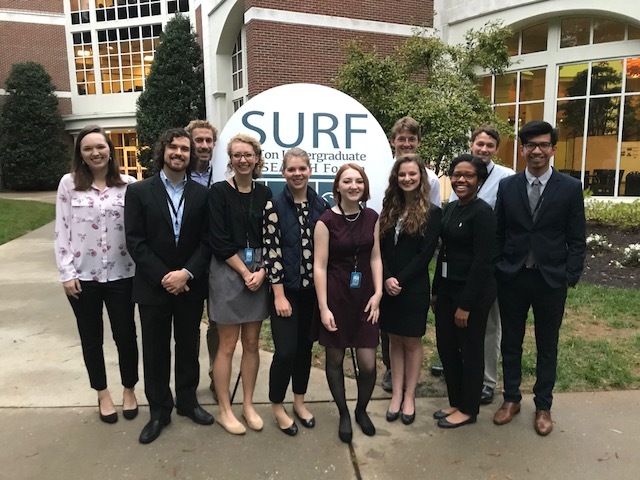 Eleven Samford University students recently traveled Wofford College in Spartanburg, South Carolina, to present their research at the Southern Conference Undergraduate Research Forum (SURF). Chris Kawell, senior, computer science, Birmingham, Alabama, “Integrating Traffic Incident Management Inerfaces;"
Jillian Walters, first year pharmacy, Hattiesburg, Mississippi, “Synthesis and Conformational Analysis of 3+4 Cycloadducts to Evaluate the Possibility of Remote Anchimeric Assistance." The group was accompanied by faculty advisors Bryan Johnson, University Fellows director, and Paul Wiget, chemistry and biochemistry. The SoCon invites up to 15 students from each of the 10 member schools to present original research in paper or poster form. Students are chosen based on nominations from faculty. In its second year, SURF works to support undergraduate research. A student presented his or her research on a poster and stood with it in an auditorium, while attendees had the opportunity to walk around and ask questions. Some students also did oral presentations of their research to an audience. “The SURF conference, in the last two years, has created an impetus on Samford’s campus to find a way to support undergraduate research at a higher level,” said Thomas Woolley, Samford’s senior associate provost.